We’d love your help. Let us know what’s wrong with this preview of Hearts Alight by Elliot Cooper. In the quest to craft the perfect gift, Dave tries to urge a few personal details out of stoic Amit. Unintentionally, he learns the Cohen family’ Dave Cunningham hates the rampant consumerism that’s come to dominate his family’s Hanukkah celebrations. But a chance to bring a bit of a holiday happiness to his long-time crush, Amit Cohen, helps put him in a more festive mood. To ask other readers questions about Hearts Alight, please sign up. This is the fourth story I have read thus far by this author. Each one of them has been distinctly unique and exceptionally well-written. He clearly has a true talent for story-telling. This holiday novella is heartwarming, sweet and has an appropriate magical twist. Their were more than a few tears of happiness and the story left me feeling warm and very happy. Miracles really do happen every day! I went into this pretty naïve about what a golem was and admit to googling it. Once I did a bit of light research, getting the gist of a golem being probably made of clay and unfinished in the eyes of God, I was more than curious how this would all work out. Dave, I get him. Though our religions are different, the way he feels about the present-palooza that is taking over Hanukah is how I feel with the commercialization of Christmas. Through all we think we have to do, have to buy and to keep up with the Joneses, it lessens the true meaning of the holiday. I mean, I do get trying to blend the modern traditions with the old but still… ugh. But Dave, he is willing to put it aside to hang out with his friend Jake and get a chance to see his crush, Jake’s uncle Amit. Goodness, that first glimpse of Amit at the bar all stoic and silent just pulled at my heart. Seeing him through Dave’s eyes really gives you the chance to see Amit for the beautiful man that he is. He is also the man Dave is trying to make a gift for, the perfect gift and one that isn’t bought. When a jerk wad makes fun of Amit and Amit takes off, Dave goes after him and we get to learn a secret. Your secret sort of challenged everything I thought I understood about the world. And just...everything. So I kept thinking about it and what it meant and what it could mean. Knowing the small amount of information regarding golems, I found it so very endearing that Dave takes Amit to his father’s shop and shows him the dreidels he has made. The way he takes care of them and who he makes them for makes a lot of sense and when Amit tells his secret about being a golem and Dave touches him… the connection and chemistry was amazing to witness. I like that Jake tells Dave Amit can “recharge” his batteries when touched by someone who cares. Obviously, Jake and Shoshanna care about him but the difference between familial love and that of a romantic love could be what keeps Amit Earth bound, even after he’s fulfilled his spiritual obligation. The date playing D&D and Amit setting up his character was adorable. I loved his character’s name and all that he put in as traits. The uncertainty of the new relationship with Amit and Dave was bittersweet as Dave accepts Amit but there are the facts of his being non –human that could make things difficult. The first night of Hanukah with Dave’s family was just adorable and the exchange of gifts between Amit and Dave were sigh worthy. This story, was so hopeful and heartfelt that I wasn’t ready for it to end. I just hope whatever Dave learns from Joe is magical enough to let this new relationship continue for a very long time. Hmmm.... while Amit being a (view spoiler)[golem (hide spoiler)] is a unique twist, but at the same time, I just can't see the significance of it. It can easily be a contemporary romance, with a young man and his best friend's uncle. In fact, I might like it better *shrugs*. This is just a so-so read for me. This was such a lovely little holiday novella on so many fronts, and I snuggled right into it. Dave was so easy to identify with: he’s a gaming nerd, so done with holiday consumerism, and frustrated at feeling the guilt of not being able to be “on par” with the gift-giving going on around him. He’s also just awkward enough to get in his own way, and overthinking himself out of confidence. In short, he’s adorable. The dash of holiday magic here is in the Golem, yes, but also in the blending of fam This was such a lovely little holiday novella on so many fronts, and I snuggled right into it. Dave was so easy to identify with: he’s a gaming nerd, so done with holiday consumerism, and frustrated at feeling the guilt of not being able to be “on par” with the gift-giving going on around him. He’s also just awkward enough to get in his own way, and overthinking himself out of confidence. In short, he’s adorable. The dash of holiday magic here is in the Golem, yes, but also in the blending of family, friendship, compassion and the shared desire to give, but not in the consumerism way. That it also involved some Dungeons & Dragons, latkes and a little bit of golem magic just made it all the more up my alley. Also, the wide range of queer identities included here bears mentioning, including a bi main character, and a trans man supporting character. Another great story from Elliot Cooper. There was so much I loved about Hearts Alight. The mythology surrounding golems was completely new to me and I loved Dave, Amit, and their extended friends and family. I adored Dave's friendship with Jake, and the hesitant beginnings of his romance with Amit. His musings about the modernisation of Hannukah in particular with regards to its commercialisation developed over the course of the story, and added a layer that I really appreciated. I feel a little Another great story from Elliot Cooper. There was so much I loved about Hearts Alight. The mythology surrounding golems was completely new to me and I loved Dave, Amit, and their extended friends and family. I adored Dave's friendship with Jake, and the hesitant beginnings of his romance with Amit. His musings about the modernisation of Hannukah in particular with regards to its commercialisation developed over the course of the story, and added a layer that I really appreciated. Beautiful, fascinating, tender. A lovely story with lots to ponder. This was a gorgeous little Hanukkah/Christmas story that doesn't disappoint. I'm a firm fan of Elliot Cooper's writing and this story was just as brilliant as every other I've read. There was a great depiction of the holiday - Hanukkah - without it being a lecture on what the holiday or what it meant to people. Some books tend to be more of a lesson, but this one had a nice natural feel that allowed for a personal description of what the holiday meant to Dave, without being over-done. There was e This was a gorgeous little Hanukkah/Christmas story that doesn't disappoint. I'm a firm fan of Elliot Cooper's writing and this story was just as brilliant as every other I've read. There was a great depiction of the holiday - Hanukkah - without it being a lecture on what the holiday or what it meant to people. Some books tend to be more of a lesson, but this one had a nice natural feel that allowed for a personal description of what the holiday meant to Dave, without being over-done. There was excellent writing style, description and characterisation. I loved the chemistry between Dave and Amit. The entire story is a really original twist on the "in love with the best friend/brother-in-law's uncle" idea. I loved Jake, who was an excellently written trans character, as well as Dave's best friend and brother-in-law. Dave's bisexuality was nicely explored without being in-your-face. I love how both were mentioned, how they were dealt with in terms of the family's religious views and family setting. I also absolutely love the fact that there's an entire paragraph challenging all the thoughts I have in stories like these - is it weird, because of their legal relationship? Was Amit asexual, aromantic, straight? And did any of it matter if there was a connection. Major kudos to Elliot for adding that, because I'm always asking myself these questions in other stories and I didn't have to here, because it was done for me. I loved the golem aspect of the story. It was a surprise, well written, and really well explained without, again, being over-done or a history lesson. At the same time, I really loved that Dave's love of pottery painting and his experiences with it had already been really nicely explored before the revelation. I'm not a D&D player, but there was a really nice description of the game that will appeal to players and non-players alike, as it shows some really nice bonding time between Dave and Amid. I didn't need to follow it, because it wasn't overly technical, but more of a conversation that had nice balance. And can I just say YES! to the fact that Dave's favourite childhood movies are Willow and The Princess Bride? It's like we had the same childhood! Adorable, beautiful, and with great characters. There was a perfect ending, that left the story open and not at all clean cut and "forever" but still gave it the feel of hope and a future together. I'm never disappointed by this author and this one proves why. A perfect Christmas Day read. "He could just exist and feel tethered to some semblance of normalcy, locked in Amit's gaze. No pressure to talk. No pressure to be interesting. Just two souls sharing the same wavelength." ""I have so many questions," Dave said, his voice soft, as if Amit were so fragile that loud tones might break him. 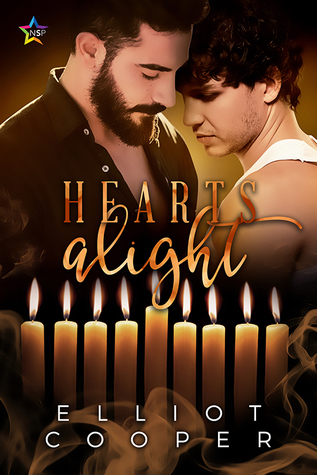 Hearts Alight tells the story of Dave, an anti-consumerist, slightly anti-social bisexual Jewish man who tries to befriend his crush who is also his best friends' uncle. While I liked this book fine enough, and I am happy it exists in the world for those who would relate to it more, I had some issues with the romance aspect of it. When Dave finds out Amit, his crush, is a golem after he nearly collapses at a bar, I expected some sort of supernatural or paranormal element to start infiltrating the Hearts Alight tells the story of Dave, an anti-consumerist, slightly anti-social bisexual Jewish man who tries to befriend his crush who is also his best friends' uncle. While I liked this book fine enough, and I am happy it exists in the world for those who would relate to it more, I had some issues with the romance aspect of it. When Dave finds out Amit, his crush, is a golem after he nearly collapses at a bar, I expected some sort of supernatural or paranormal element to start infiltrating the story. We don't really get that aside from a few mentions of learning magic. I liked that Dave and Amit were a "normal" couple and didn't let the golem aspect of it matter to their lives, but at the same time it just seemed that everyone involved accepted that magic existed and this was real without batting an eyelash. I also was a bit confused as to why the golem bit even existed in the story? Perhaps it was related to something Hebrew that went over my head, but honestly you could have the same story without the fact that Amit was a golem and it would read in the same way. There are a lot of things in the book that are brought up but dismissed with no resolution, like the fact that Amit is immortal. The author seems to spend more time describing a game of D&D than it does on any of the real supernatural elements. The fact that Amit was dying until Dave came into his life romantically happens about halfway through the book, and the story feels like it loses something at that point. There's nothing to build up to really after that point. I love that this book has a M/M romance as well as Jewish characters, which is often hard to find and even harder to order in a physical format (as many are ebook only). It also had a holiday theme which was great. I initially found this while searching for romances that involved holidays other than Christmas, so I'm glad our library now has this as an option. I also loved the LGBT elements of this, especially the fact that a prominent character in this is a trans man and it is treated without pomp and circumstance. Jake was just a best friend who tried to help Dave in his life and his gender didn't define him as a character. Overall this is a cute, short romance that would be great for any holiday romance display. Someone not knowledgeable about Hanukkah or Judaism may struggle to understand some of the things referenced, but learning is fun and this is a good way to get an intro. While I liked a lot about this charming Hanukkah novella, for some reason it just didn’t grab me. Dave is an introverted nerd who works at his dad’s pottery studio, while Amit is the reserved bartender at his brother-in-law’s family bar – and also a golem. There’s some pretty cute things – from Dave’s crush being able to “power” Amit to Dave introducing Amit to D&D to Amit hating dreidel song (think about it). But while I thought they were adorable, I didn’t really feel the connection betwee While I liked a lot about this charming Hanukkah novella, for some reason it just didn’t grab me. Dave is an introverted nerd who works at his dad’s pottery studio, while Amit is the reserved bartender at his brother-in-law’s family bar – and also a golem. There’s some pretty cute things – from Dave’s crush being able to “power” Amit to Dave introducing Amit to D&D to Amit hating dreidel song (think about it). But while I thought they were adorable, I didn’t really feel the connection between them. The pacing between them felt odd, with their relationship going in fits and spurts, though I found Dave’s second date worries about how the end of the date goodbye is going to go – a hug? a kiss? – endearing. I also feel a bit weird listing this as paranormal, because while Amit is a golem, I think there’s more time spent on them playing D&D than “actual” magic. It was also very low-angst, which I did enjoy, but almost to the point where I wasn’t sure where the story was going. There was a big deal made of Dave’s dislike of the consumerism and one-upping gift culture around the holidays, and while Amit offered one Hanukkah-centered rebuttal that seemed to sway Dave, it didn’t seem like it sunk in for him. Although, the low angst-ness also extended to its LGBT characters – Dave is bi and a supporting character is trans, and it’s all viewed as no big deal, which is always lovely to read. 2.5 stars. Interesting concept but the execution was underdeveloped and the romance was uninspiring. Dave finds out that the guy he's crushing on, Amit, is a golem - in Jewish folklore, a man created from clay - but other than that fact, we don't learn anything interesting about his existence, and everyone is so blase about his identity that it loses any of its magic. So many questions are unanswered, or asked and quickly dismissed (like the unsolvable dilemma that Amit is immortal and Dave is n 2.5 stars. Interesting concept but the execution was underdeveloped and the romance was uninspiring. Dave finds out that the guy he's crushing on, Amit, is a golem - in Jewish folklore, a man created from clay - but other than that fact, we don't learn anything interesting about his existence, and everyone is so blase about his identity that it loses any of its magic. So many questions are unanswered, or asked and quickly dismissed (like the unsolvable dilemma that Amit is immortal and Dave is not). The author seems more interested in describing the Dungeons & Dragons game that Dave loves than in exploring the half-hearted fantasy he has created. This is a really cute, sweet story with some really beautiful images. I relate to many feelings David has about how his relationships usually don’t last and him being the common denominator between failed relationships, as well as feelings about commercialism and consumerism now a part of Hanukkah traditions. Growing up, I did love getting presents, but as I’ve gotten older the family time and, of course, the food is way more important to me. Not exactly my cup of tea; there wasn't as much action as I prefer. Not that that's a bad thing. If you like quiet reads, this is a great one. I enjoyed this take on the golem mythos, and the D&D scenes reminded me of my own sessions. Would recommend this book to anyone looking for a quiet holiday romance with a paranormal twist. I loved, loved, loved this. Purchased because someone rec'd it and I thought it sounded interesting (mostly due to the fact that it's not the bog-standard while Xtian boy holiday romance). Fell in absolute LOVE with the characters. I would totally read more stories with these folks. Really loved the premise of this one and it had a very sweet romance and friendships. Too much detail on insignificant events and not enough on the character or relationship building. I am always excited to see Chanukah stories this time of year, and Heart’s Alight offers a unique take on the holiday with its bit of a paranormal vibe. I think Cooper does a nice job bringing the flavor of the holiday into the story. We see the family celebrations and learn about some of the traditions in a way that works organically. It is enough detail to root the story in the holiday, but doesn’t overwhelm the short book. I also thought the golem aspect was i A Joyfully Jay review. I am always excited to see Chanukah stories this time of year, and Heart’s Alight offers a unique take on the holiday with its bit of a paranormal vibe. I think Cooper does a nice job bringing the flavor of the holiday into the story. We see the family celebrations and learn about some of the traditions in a way that works organically. It is enough detail to root the story in the holiday, but doesn’t overwhelm the short book. I also thought the golem aspect was interesting. The book reads very contemporary, so this is just a slight bit of the paranormal/fantasy woven in. As I noted, a golem is a legendary being created from clay, and we learn more about the legends, as well as why Amit was brought to life. So I thought this was a nice twist, especially tying in with the holiday in terms of miracles, magic, and other Chanukah themes. I did feel this went a little undeveloped however, and would have liked more detail on how Amit was created, how his life is different as a golem than a person, and how a future relationship with him might work. At one point they note that while Dave will age and die, Amit won’t, and that might be an issue, but then it is dropped and never addressed again. Also, the crisis over Amit’s magic and his fading health is resolved by halfway through the story. This seems like the main conflict of the book, and so after that, the focus gets a bit more vague, and the issues of Amit as a golem don’t really get brought up again. This book delivers completely on the promise of its lovely cover art. It's a cozy and sweet Hanukkah romance. I don't read a lot of contemporary novels, but I enjoyed this book very much, at least partly because the main character was easy for me to identify with. Dave is young, late twenties, but his attitude towards his family's Hanukkah celebrations has always been a little bit curmudgeonly. He's not sure Hanukkah should be celebrated in a similar way to Christmas, and he's also afraid that t This book delivers completely on the promise of its lovely cover art. It's a cozy and sweet Hanukkah romance. I don't read a lot of contemporary novels, but I enjoyed this book very much, at least partly because the main character was easy for me to identify with. Dave is young, late twenties, but his attitude towards his family's Hanukkah celebrations has always been a little bit curmudgeonly. He's not sure Hanukkah should be celebrated in a similar way to Christmas, and he's also afraid that the gifts he can afford to buy won't measure up. Dave is hesitant to pursue a relationship with his crush, Amit, who is the uncle of his best friend and brother-in-law. Dave's somewhat awkward around other people, in ways that reflect my own experiences with social anxiety. There is no real conflict between anyone in this story, only between Dave and his own difficulties with people. So it's great to see him become close to Amit, more comfortable with both his and Amit's families, and excited for the future. The supernatural elements blend right into the rest of the story, in a magical-realism sort of way. I also really like the detailed Dungeons & Dragons scene, not just because I enjoy RPGs, but because it serves to show Amit's playfulness. That was the point in the story when I first felt that these two characters definitely belong together. Cute, though my eyes were about to glaze over during the D&D scene. I would've started skimming if it had gone on any longer. I would have liked more relationship development between Dave and Amit, too. As it stands, it can't really be anything more than a HFN, because (view spoiler)[it's revealed in the story that Amit, who is a golem, won't age or die in a human way, while Dave will continue to age as a normal human. (hide spoiler)] So, I do wonder how a relationship would work between the Cute, though my eyes were about to glaze over during the D&D scene. I would've started skimming if it had gone on any longer. Dave is quite the introvert and modern day Hanukah scrooge. He loves the holiday, but hates the commercialization that seems to have taken over. It takes a health scare from his crush to help Dave see things in a different light and come out of his shell a little bit. A sweet and heart-warming holiday tale! The development of Dave's and Amit's relationship was very touching. I only wish Amit's origins were explored more, since it's such a fascinating concept. A very enjoyable seasonal read!